On the east side of the Pekin National Bank, on the wall facing N. Capitol Street at the Corner of Court Street, is an informative plaque telling of an important event in Pekin’s history – the founding of the Union League during the Civil War. This column on Feb. 4, 2012, briefly told of the founding of the Union League. In addition, an article in the Aug. 16, 1975 Pekin Daily Times that lacked a byline but was accompanied by two photographs not only told the story of the Union League but also related the history of Pekin’s historical plaques that have commemorated the Union League. 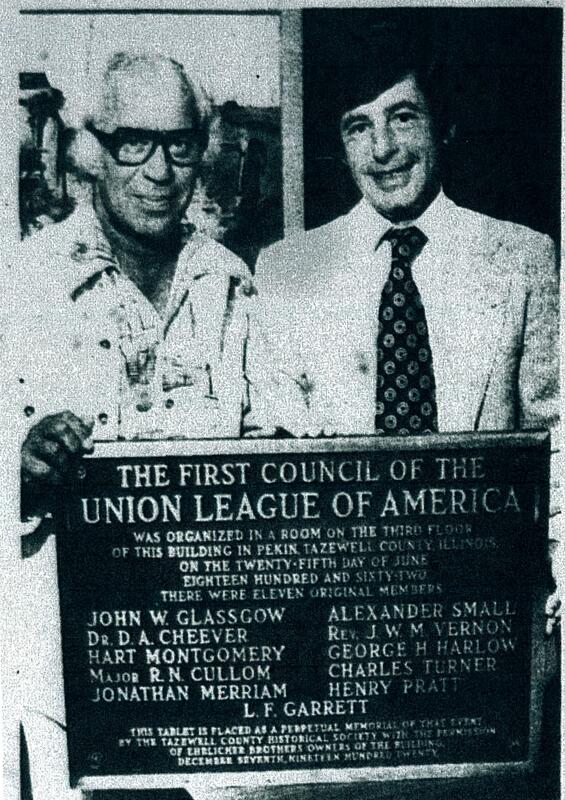 Shown in this photograph from the Aug. 16, 1975 Pekin Daily Times are Marty Perlman, left, and Gerald Conaghan, right, president of Pekin National Bank, holding a historical plaque commemorating the founding of the Union League. The plaque was first placed on the east wall of the old Smith Bank/Perlman Furniture building at the corner of Court and Capitol in 1920, but in 1975 was remounted in the lobby of the Pekin National Bank, which was built on the same site as the Smith Bank/Perlman Furniture building which burned down in 1968. “It was June, 1862, and the early summer weather in Pekin had taken a back seat to the bad news coming from such places as Shiloh, the valley of the Shenandoah and communities in Indiana and other northern states which had been hit by Confederate raiders. “There were reports of sabotage by southern subversive groups like the Golden Circle and the Sons of Liberty, and these, plus inflation and the draft, were beginning to shake the faith in President Abraham Lincoln’s Civil War policies. “It had become clear to a handful of Pekin leaders that something should be done to firm up the North’s support for the war and to strengthen their resolve to abolish slavery in the South. “Then came the one bright spot: the capture of Ft. Donelson by Gen. U. S. Grant and the freeing of Tennessee, much of which had remained fiercely pro-union despite harsh Confederate measures to crush Union sympathizers. “As a result, those Tennesseeans (sic) remaining true to the north had met secretly to encourage each other to oppose the Confederate government. These groups called themselves Leagues of Union men or Union Leagues. . . .
“The concept was brought to Pekin by the Rev. 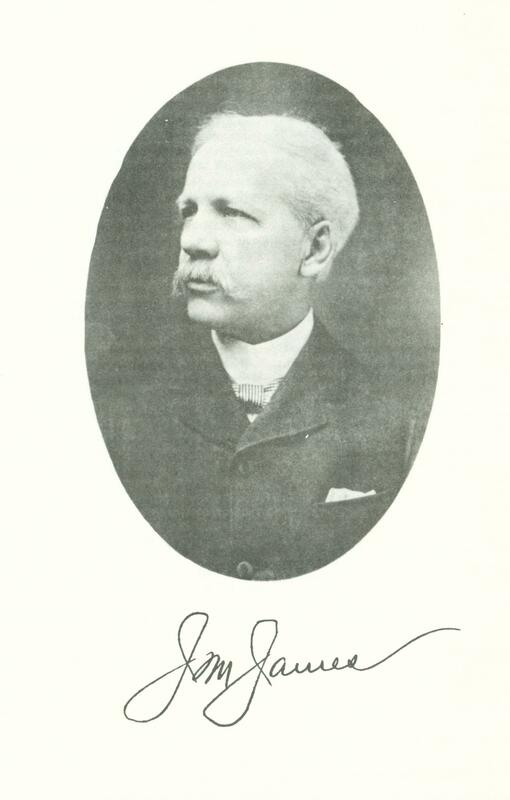 J. W. N. Vernon, the new minister of Pekin’s First Methodist church, who had just come to this community from Tennessee. “And so it was that on June 25, 1862, Rev. Vernon and ten other Pekin men gathered secretly on the third floor of the old brick building at Court and Capitol known for many years as the Smith Bank building. “From that meeting came the Union League, an organization which became one of the most influential and fast-growing movements in the nation’s history. “Within a year of the original meeting, the League had 606 councils and 75,000 members in Illinois alone and eventually may have had 2 million members in councils in nearly every local township and village in the North. As this column recounted over five years ago, in the initial stages of the Civil War pro-Confederacy and pro-slavery sentiment remained prominent even as far north as Peoria and Pekin (both communities having been founded by slave-owning families). Consequently, prior to the formation of the Union League “those who believed in the Union spoke often in whispers in Pekin streets and were wary and often afraid,” says the 1949 Pekin Centenary. Besides Rev. Vernon, the founding members of the Union League were Richard Northcroft Cullom, former Illinois state senator; Dr. Daniel A. Cheever, abolitionist and Underground Railroad conductor; Charles Turner, Tazewell County state’s attorney; Henry Pratt, Delavan Township supervisor; Alexander Small, Deer Creek Township supervisor; George H. Harlow, Tazewell County circuit clerk; Jonathan Merriam, stock farmer who became a colonel in the Union army; Hart Montgomery, Pekin postmaster; John W. Glassgow, justice of the peace; and Levi F. Garrett, Pekin grocery store owner and baker. After the Civil War, the Union League became a Republican Party social club, but would carry on its abolitionist legacy through support of civil rights for African Americans. That time and place came on Tuesday, Aug. 19, 1975, when the old 1920 plaque was remounted in the lobby of Pekin National Bank (built on the site of the Smith Bank/Perlman Furniture Co. building) on the occasion of President Gerald R. Ford’s visit to Pekin to dedicate the Pekin Public Library and Everett M. Dirksen Center. But a few days before that, the outside plaque on the east wall of the Pekin National Bank had already been mounted. That plaque, donated by the Union League of America and the Illinois State Historical Society, was formally dedicated at the same time as the remounting of the 1920 plaque. Last month we learned the name of the riverboat whose deckhands went on a drunken spree through the streets of Pekin on July 4, 1851 – the Lucy Bertram. This week we’ll take a closer look at the history of the Lucy Bertram, which plied the waters of the Mississippi and Illinois rivers during the heyday of the American steamboat. As a matter of fact, there were two steamboats christened with the name “Lucy Bertram.” It was the first Lucy Bertram whose deckhands entered Pekin’s history. According to William J. Petersen’s “Steamboating on the Upper Mississippi” (1968), page 320, the Lucy Bertram was a 268-ton sidewheeler that was launched at St. Louis, Mo., in 1847. “During the Civil War in the sixties, there was a packet line of steamers running between St. Louis and Keokuk. These were named the Hannibal City, Warsaw, Rob Roy, Lucy Bertram, Die Vernon, Hardy Johnson, and Andy Johnson. These were all splendid side wheel steamers. The crews were noted for their skill and popularity, their stewards and chefs were the best money could hire. Many a passenger made the trip on one of these boats to enjoy the accommodation, music and meals, for traveling at that time was indeed a pleasure. These boats being larger and drawing too much water could not go above the lower rapids at Keokuk, so there was another line of boats called the Northern Packet Company which ran its boats between St. Louis and St. Paul . . . .
Pekin old-timer Emil Schilling said the deckhands of the boat we now know was the Lucy Bertram who were involved in the 1851 riot in Pekin were African-American, as was common on steamboats during this era. However, Hunsaker’s book includes both actual historical sources as well as fictionalized or imagined diary entries, and it’s not clear whether the Finn Burnett diary/memoir is real or imagined. In Hunsaker’s book, Burnett speculates that Twain’s character Huckleberry Finn may have been inspired by Burnett’s own childhood experiences growing up on the Mississippi River and traveling with his Uncle David on the Lucy Bertram. Shown is the second Lucy Bertram, a 698-ton steamboat which plied the waters of the Mississippi from 1863 to 1878. The deckhands of the first Lucy Bertram, which was launched in 1847, were involved in a drunken riot in Pekin in 1851. The reason this militia company was formed was one of the most important events in U.S. history – the Confederate States of America’s attack on Fort Sumter on April 12, 1861, which sparked the U.S. Civil War. Soon after, militia companies were established throughout the remaining United States to prepare to aid in the Union’s war efforts against the Confederacy, and the Pekin Zouaves were one of those companies. But why was this company called “Zouaves”? The original Zouaves were a French army light infantry corps organized in 1830 – at first the French Zouaves were all Algerians from North Africa, and consequently their uniforms were Middle Eastern or Turkish in style. Romantically imitating the French Zouaves, other nations also established their own companies of soldiers wearing Zouave-style uniforms, including militia companies in Illinois and Missouri during the early months of the Civil War. “As a result of a direct order from President Lincoln to alleviate the prejudice against the Irish, the 8th Missouri Infantry was organized in St. Louis from June 12 to August 14, 1861. Over 600 Irish boatmen & deck hands left the St. Louis riverfront to fight under the command of Captain Morgan L. Smith. Originally from New York, he and his brother, Captain Giles A. Smith, also recruited troops from Bloomington, Illinois. The 8th MO uniform was that of the American Zouaves. “The Peoria Zouave Cadets were organized in Peoria, Illinois 3/23/1861. They recruited up to war strength and left for St. Louis on 6/19/1861 but, upon their arrival, there was a disagreement and about half returned to Illinois to join the 17th Illinois. 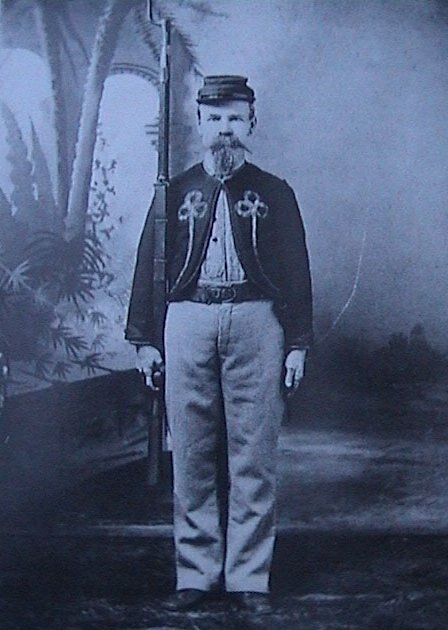 An under-strength company calling themselves the Pekin Zouaves from Pekin, Illinois, sent about 30 recruits from Peoria to St. Louis, and filled up the company. They mustered in as Company H. Neither company provided the ‘Zouave influence’ for the company since they were already being referred to as the ‘American Zouave Regiment.’ Company L sharpshooters were recruited in Cape Girardeau, Missouri. As this column has noted previously, one of the members of the Pekin Zouaves was none other than Pekin’s pioneer historian William H. Bates (1840-1930). Of the five original officers of the Pekin Zouaves, Capt. G. W. Baker is listed on page 13 of the 1861 Pekin City Directory as “BAKER, GEORGE W. F., ambrotype and photographic gallery, cor. Court and Second ; bds. Tazewell House.” Thus, Baker was, like Henry Hobart Cole, one of Pekin’s early photographers. This photograph from the collection of Steven Schmit of Richmond, Va., shows Civil War veteran William H. Bates of Pekin wearing his old “Zouave” uniform. First Lieut. H. P. Finigan was Henry P. Finigan, a Catholic Ulster-born Pekin attorney, land and real estate agent, and grain merchant. Finigan with his wife Margaret and Margaret’s parents together escaped the Irish Potato Famine and settled in Pekin. Henry’s date of birth is uncertain, because when he registered for the draft in June 1863, his age was written down as 31, but the 1870 U.S. Census says he was 34 at that time (that census also mistakenly gives his middle initial as “B.” rather than “P.”). Second Lieut. L. B. Greenleaf was Luther Berge Greenleaf, born in Connecticut in 1834 or 1836, died August 1902 in Onarga, Ill. The 1861 Pekin City Directory says he was then a law student. His Onarga newspaper obituary says although he studied law, he instead became a journalist in Peoria, later moving to Kansas for a while, then finally settling down in Onarga. Third Lieut. W. M. Olmsted was William M. Olmsted (1802-1872), who in 1861 was a clerk at Stephen Roney’s Hardware, 33 Court St., at the corner of Court and Second. Olmsted later was promoted to the rank of captain during the civil war. His grave in Lakeside Cemetery is one of the old Oak Grove Cemetery burials. Lastly, Orderly Sgt. C. R. Cummings was none other than Columbus R. Cummings (1834-1897), a prominent Pekin businessman and land owner who subsequently served as Pekin’s 20th mayor (1875-1876), later moving to Chicago, where he became a Gilded Age railroad tycoon and banker. It was the heirs of C. R. Cummings’ great estate who in 1916 gave the Pekin public schools an athletic field with the stipulation that it should be named after the estate manager James M. James (1849-1918). Here’s a chance to read one of our old Local History Room columns, first published in June 2013 before the launch of this blog . . . Readers of the Pekin Daily Times in the spring of 1918 found a remarkable and attention-grabbing change in the layout of the front page of the Wednesday, May 8, edition. But just who was James Morris James, and what was it about him that his death at the age of 69 from heart trouble brought the city of Pekin to shut down for a few hours in the middle of the week? In finding to the answer to that question, we can gather a few initial clues by noting the list of pall bearers at his funeral. One of pall bearers was none other the Pekin’s mayor, Charles Schaefer. Besides the eight actual pall bearers, 20 other men were named as honorary pall bearers. Together, the list of active and honorary pall bearers included most of Pekin’s community leaders. Rev. Hawkins’ glowing tribute to James’ memory is one more indication of just how highly esteemed he was. So also was James’ obituary, which was published in the Monday, May 6, 1918, edition of the Pekin Daily Times. His obituary was unusually long and included a detailed biography, and nestled beside the obituary was a paid advertisement – an expression of appreciation from Farmers National Bank and an announcement that the bank would close at noon Wednesday for James’ funeral. As his obituary states, James joined the bank’s board of directors in 1884, became its vice president in 1905, and became the bank president in 1911. “Mr. James . . . . in November, 1861, began working at the printing business on a local paper, and later, for a short time, was employed on the old Illinois River Railroad (now Chicago, Peoria & St. Louis Railroad.) In October, 1863, he secured employment as a clerk in the dry goods store of C. B. Cummings & Brother, remaining with them until 1870, when he became bookkeeper for Columbus R. Cummings, railway contractor and builder. His duties including the caring for the local affairs of his employer, and since 1879 he has had charge of both the bank and extensive farm interests of Mr. Columbus R. Cummings, after the removal of the latter to Chicago. Mr. James was a member of the Cummings Harvester Company and its president, while it was in business, from 1889. . . . It is evident, then, that his prominent place in the community was chiefly due to his role as agent and custodian of the vast Cummings estate in Pekin and the surrounding areas. As this column has previously noted, Columbus R. Cummings was one of the wealthiest and most influential men in Pekin, and served a single term as Pekin’s mayor. 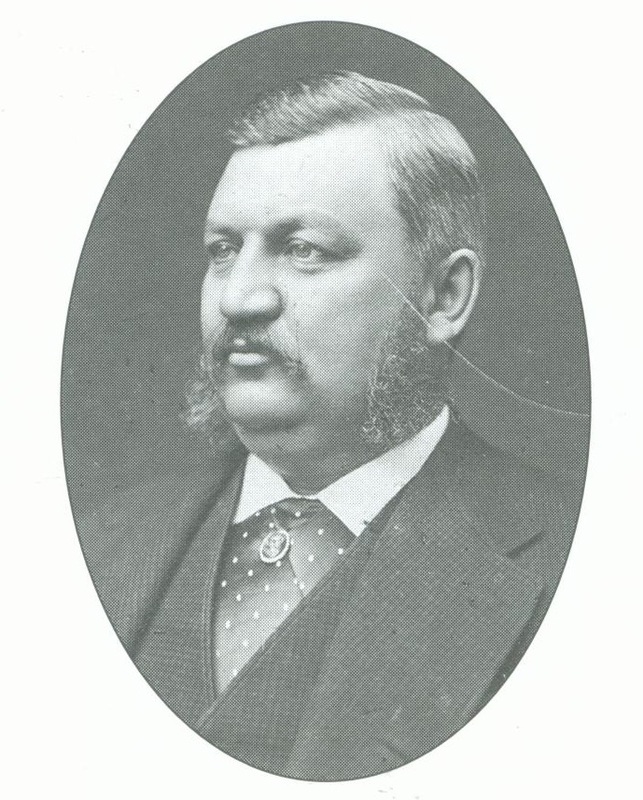 Stung by the failure of his bid for reelection, however, Cummings abruptly gave up the mayoral office, not even finishing out his term, and moved to Chicago, where he became a powerful railroad tycoon. After leaving Pekin, Cummings employed James to manage his estate. Though James’ funeral had brought Pekin to a temporary standstill, today, 95 years after his death [NOTE: now 99 years], probably few Pekin residents remember him. Yet there is a lasting public memorial to his life: James Field, across Broadway from the former Pekin Community High School West Campus. David Mark Cummings and his wife Ruth were two of the four people who, on June 5, 1916, sold nine lots in Pekin’s old Colts Addition to Pekin School District of Tazewell County, the predecessor of Pekin Public School District 108. The land was sold to provide an athletic field and playground for the school children of Pekin, with the stipulation that it would be named for James. It was only a few years ago that the field was restored through the efforts of the Save James Field Committee. It is now supervised and maintained by the Pekin Park District. Here’s a chance to read one of our old Local History Room columns, first published in May 2012 before the launch of this blog . . .
After Pekin was incorporated as a city in 1849, for the first 25 years its history the city of Pekin was headed by mayors who served one-year terms. During that time, 18 men were elected mayor, several of them winning a second term. In 1874, however, the people of Pekin decided city government would operate more smoothly if city hall didn’t have a changing of the guard every year. That’s when Pekin began to elect mayors who would serve two-year terms. Columbus R. Cummings (1834-1897), Pekin’s 20th mayor, was the first of our mayors to be elected to a two-year term, holding office during the years 1875 and 1876. The following biographical sketch of his life is drawn from the Pekin Public Library’s Local History Room collection, including the 1894 “Portrait and Biographical Record of Tazewell and Mason Counties, Illinois,” the 1974 Pekin Sesquicentennial, “Pekin: A Pictorial History” (1998, 2004), and Cummings’ obituary published in the New York Times. Cummings was born in Canton, St. Lawrence County, New York, on Oct. 14, 1834, one of the 11 eleven children of James P. Cummings and Clarissa Wilson. His father was a well-known attorney. When he was 16, Cummings became a school teacher, later working as a store clerk in Ogdensburg, N.Y. Leaving that job, he moved to Chicago and worked in the store of Potter Palmer for a short time. In 1859, however, he got a better job working for the Illinois Harvesting Machine Company in Pekin. His brother Cornelius B. Cummings came to Pekin at the same time, and the brothers went into business together as dry goods merchants under the name of C.B. Cummings & Co.
Their partnership ended in 1861, but Columbus went on to other successful endeavors, becoming a prominent businessman and landowner. Through his wife Sarah Caroline Mark, Columbus became the heir of David Mark, whose real estate holdings were the largest in Tazewell County at the time of his death. “C.R.” was one of the owners of the Pekin Railway Construction Co. and later was president of the Pekin, Lincoln & Decatur Railway. He also was one of the founding trustees of the Pekin Agricultural and Mechanical Association. “With due credit, during his administration Pekin paid off all bonds on the due date – a rare achievement in those days, as already indicated. However, when Cummings sought re-election, he was defeated by 33 votes in a hard-fought campaign against A. B. Sawyer. Cummings became embittered, never again appeared at city hall, did not preside over the vote canvass, and shortly thereafter left Pekin and moved to Chicago. An Englishman in a predominantly German community, Cummings may have had other reasons for his dissatisfaction. The words “became even wealthier” are an understatement. In fact, “C.R.” became one of the nation’s millionaire tycoons of the Gilded Age, and the New York Times obituary calls him “the Well-Known Chicago Capitalist.” He was president of Union National Bank and a large stockholder in First National Bank, and was a member of the syndicate that sold the New York, Chicago & St. Louis Railroad to W.H. Vanderbilt. The town of Cummings, now a part of Chicago, was named after him in 1882. Originally called Irondale, the town was rechristened Cummings when a Nickel Plate Railroad station was established there, because Cummings was the first president of the Nickel Plate. He also was president of the Lake Erie & Western Railroad and of the Peoria & Evansville Railroad. He died at his Chicago home at 1641 Indiana Ave. on July 12, 1897. Today, one visible remnant of the Cummings estate remains prominent in Pekin – James Field. Columbus’ son David Mark Cummings, born 1866, married Ruth Dexter in 1893, and had two daughters, Edith and Dorothy, and a son, Dexter. David and Ruth were two of the four people who, on June 5, 1916, sold nine lots in Pekin’s old Colts Addition to Pekin School District of Tazewell County, the predecessor of Pekin Public School District 108. The land was sold to provide an athletic field and playground for the school children of Pekin. A few years ago it was restored through the efforts of the Save James Field Committee, and is now supervised and maintained by the Pekin Park District. Pekin’s Mardi Gras . . . in October? The annual tradition of Mardi Gras carnivals arose in the Middle Ages in Europe, originating as a practical way for cities and towns to get rid of all of their meat in preparation for the 40-day Lenten period of fasting and abstinence every February and March. In those days, Catholics completely abstained from eating meat during Lent. Because there were no freezers or refrigerators all the available meat had to be eaten before Lent started on Ash Wednesday, since the meat otherwise would spoil long before Easter. Hence came the custom of having a “carnival” (Latin carne vale, “meat farewell”) on Shrove Tuesday, the last day before Lent begins. This community-wide celebration is called Mardi Gras (“Tuesday of fat”) in French-speaking Catholic countries. America’s most famous and popular Mardi Gras of course is the one held in the former French Catholic colony of New Orleans. 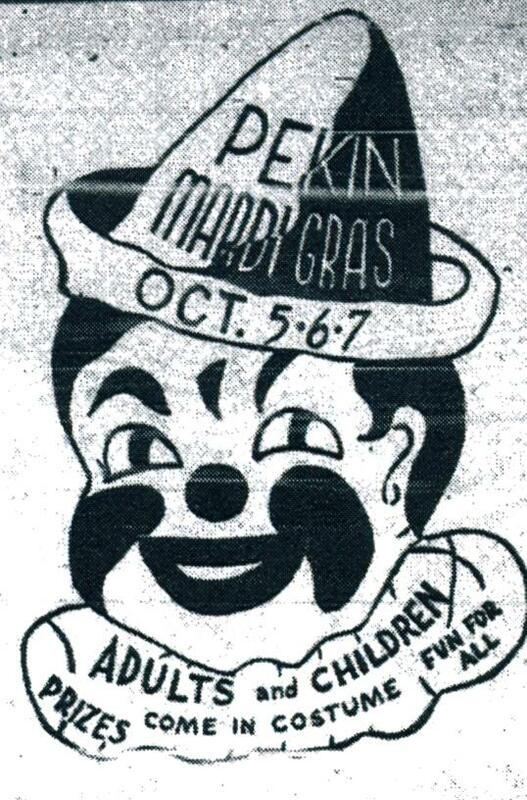 Many years ago, however, Pekin had its own Mardi Gras carnival. Unlike a traditional Mardi Gras, though, Pekin’s celebration took place in October instead of February or March. In fact, Pekin’s Mardi Gras wasn’t even on a Tuesday. A clown announces Pekin’s first Mardi Gras in early Oct. 1950 in this detail from a Pekin Daily Times advertisement. The 1950 Mardi Gras featured a carnival midway with a circus calliope, a parade, live music from four bands (including a Hillbilly band and a Hobo band), a talent show, a Mardi Gras costume ball, and the crowning of a Mardi Gras king and queen. Attendees were encouraged to come to the carnival wearing outlandish costumes, and judges awarded prizes for the best costumes. Mrs. Marilyn McCabe was the Mardi Gras hostess, Mr. Louis Dunkelberg was general chairman of the Mardi Gras, Mr. U.S. Sullivan was the parade chairman, and Miss Joan Shade was mistress of ceremonies for the Friday night talent show. Crowned Mardi Gras King during opening night ceremonies was Fred Peterson of 1010 Chestnut St., a maintenance man at Pabst Blue Ribbon in Peoria. During the Saturday night Mardi Gras ball in the girls’ gymnasium of the old West Campus high school building, Miss Ellyn Morse, 17, of Radio City (North Pekin), was crowned Mardi Gras Queen. Runners-up were Miss Norine Holiday of 300 Woodland Ave., Pekin, and Miss Marilyn Schaff of 1310 S. Ninth St., Pekin. 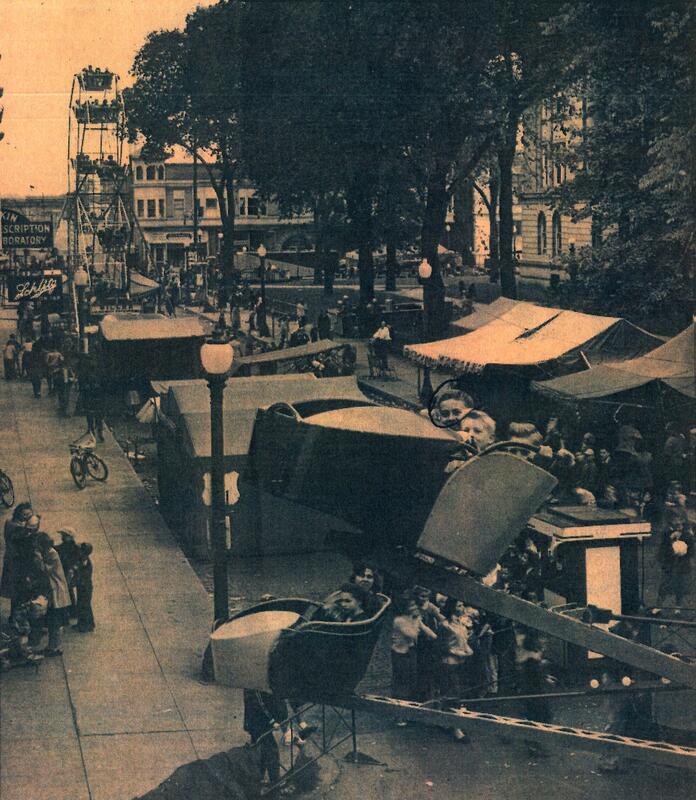 Children enjoy the rides on the Mardis Gras carnival midway along Elizabeth Street in downtown Pekin on Oct. 5, 1950. The photograph is from a newspaper clipping recently given to the library by Glen “Bud” Christopher, whose face is circled in the picture. With him in the “tub” are Larry and Billy Conarro. The boys weren’t playing hooky from school, though — the Daily Times said there was no school during Mardi Gras due to a teachers’ institute.